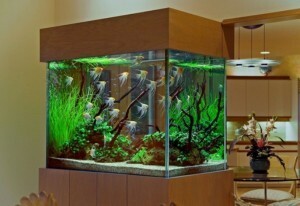 Aquariums can be a great feature in any home or business. With a variety of designs and styles, incorporating an aquarium into your decor can bring a room to life! Just as you take care and consideration setting up and maintaining your aquarium, moving it also requires special planning. Because your aquarium is a sensitive environment, and living creatures reside there – We recommend special precautions during the moving process. Whether you are relocating to a new address or simply want to move your tank to a different room, experienced help can make all of the difference! The number one priority during an aquarium move is the filtration and oxygen levels in your water. This takes meticulous care, and can be catastrophic if aerobic bacteria dies off during the transition. Since you are moving fish from one environment to another, a holding tank is required. Ensuring proper oxygen and filtration is essential! Physically moving the tank can also be a challenge. As with any fragile, large and heavy items – the proper equipment and experience is absolutely essential. As with moving any item intended to be stationary, extra attention to detail is necessary to protect the glass, base and seals on a fish tank. Give Moving Ahead Services a call if you are planning your move, or simply want to relocate your aquarium to another area of your home! Our experienced pros will work through our quoting process to ensure we gain all of the necessary details. Careful, experienced aquarium movers at our Ohio moving company for local and long distance customers.